Another treat for the holidays or any time of year. Latkes are crispy potato cakes that just beg for toppings. I like to flavour latkes with herbs and top them with caramelized onions and bacon. 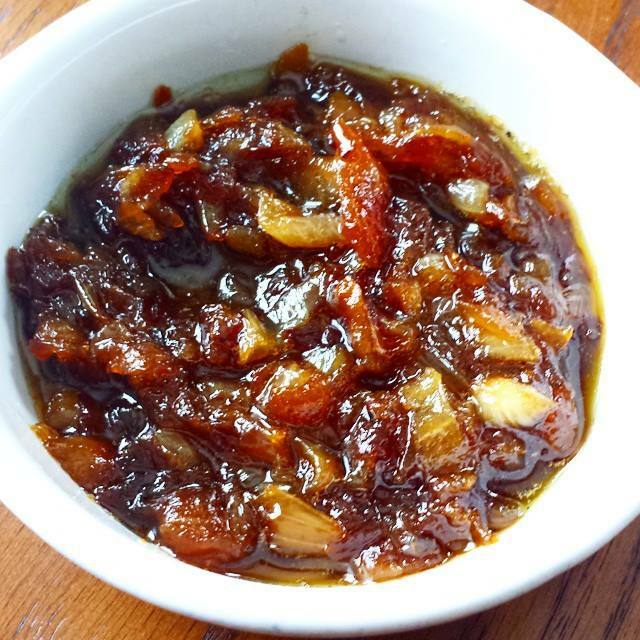 The Greek yogurt adds a touch of sour to compliment the sweetness of the caramelized onions but you can always use sour cream in a pinch. These are always a hit when I make them. Enjoy! 1. Rinse the grated potatoes to wash off excess starch. Squeeze out any excess water and dry them with paper towels. You want them as dry as possible so they will be crispy. 2. In a large bowl, combine potatoes with the garlic, chives and parsley. Sprinkle in the cornstarch and mix well to combine. Add the egg whites and season generously with salt and pepper. 3. In a large frying pan on medium heat, add enough oil to come up 1/4 inch up the side of the pan. Add butter and heat until the butter is melted. Scoop out 1 to 2 tablespoons (depending on how big you want them) of potato mixture and add to the pan, pressing down to flatten it so it will cook evenly. Repeat this 3 times so that you are frying 4-6 latkes at a time. You don't want to overcrowd the pan. Fry for about 4-5 minutes per side or until they are a dark golden brown. Adjust the heat as needed to fry evenly. Place the cooked latkes on a paper towel lined tray and sprinkle them with a little salt (optional). Place them in a low oven to keep warm while you continue frying. 4. 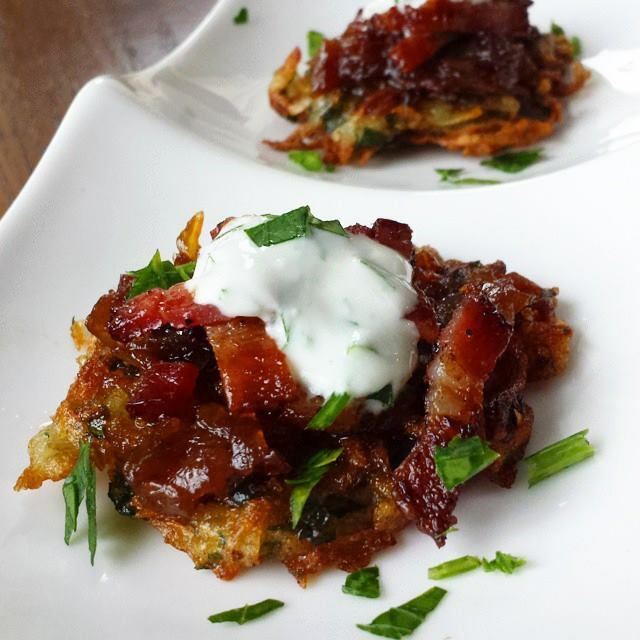 Serve the latkes topped with caramelized onions, crispy bacon, a dollop of yogurt and a sprinkle of parsley. Serve immediately. 1. To a large, heavy bottomed pan over medium high heat, add the olive oil and butter and heat for 1 minute. Add the onions, a splash of water, a pinch of salt and pepper and stir to coat. Reduce the heat to medium low and let the onions cook, stirring occasionally. After the onions have some colour, reduce the heat to low. 2 Let the onions cook for 45 minutes to an hour, stirring every few minutes, until the onions are a rich, dark golden brown color. Add a splash of balsamic vinegar (to taste) and deglaze the pan. Adjust the seasoning with salt and pepper. Let the onions cool then store, covered in the fridge for up to a week.